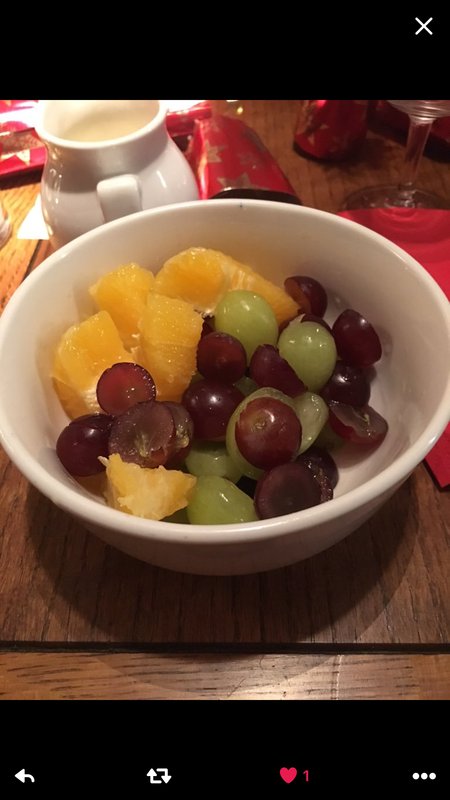 ‘Twas Christmas Eve, babe, in the B house… And whilst the boys entertain A over a few Christmas drinks, I’m taking a few moments to reflect on the miserable fruity afters served to some of my dear gluten-free compadres over the festive period. Selfless, I know. One positive of this season’s entries, there are a few less than in 2014, which perhaps reflects progress! Less fruit, and more pudding. In fact next year we might have to change the award to “The Fruit is not a Pudding, Cheese is Supposed to be as well as Pudding; and Please Could You be a Bit more Imaginative Than a Brownie Award“. Am I being ungrateful?! The key seems to be taking matters into your own hands- tell the venue what you want, broaden their horizons! First up, a classic example. Oh Debra (@likeazebora), we feel your disappointment bitterly. Although, at least bitter would be a bit more flavoursome than this out-of-season offering. 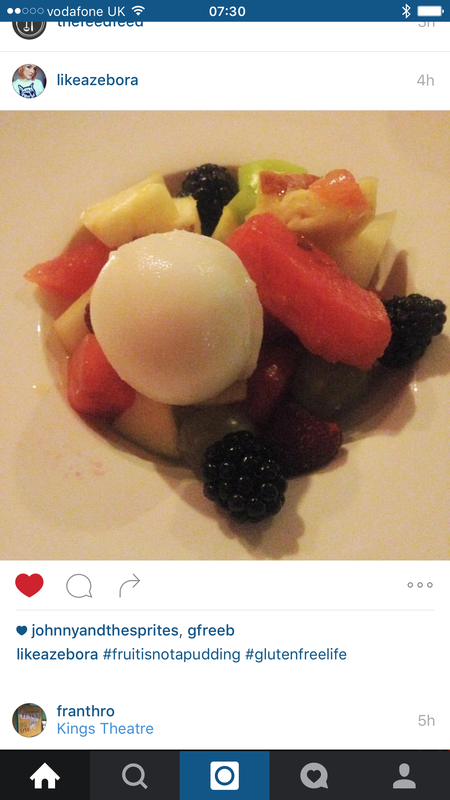 It was almost redeemed by the sorbet, but then we noticed that someone seems to have sneezed on your pineapple chunk. Our condolences. Second up is poor Ann. We don’t quite know what to say to this bowl of misery, which looks like something I’ve tried to salvage from the remnants of the fruit bowl at work (after everyone has taken the good bits). “What can we do to cheer this vulgar bruised pear up?”, thought the chef. “There’s a bit of Tropicana left from the breakfast buffet!” proffered a passing potscrub. 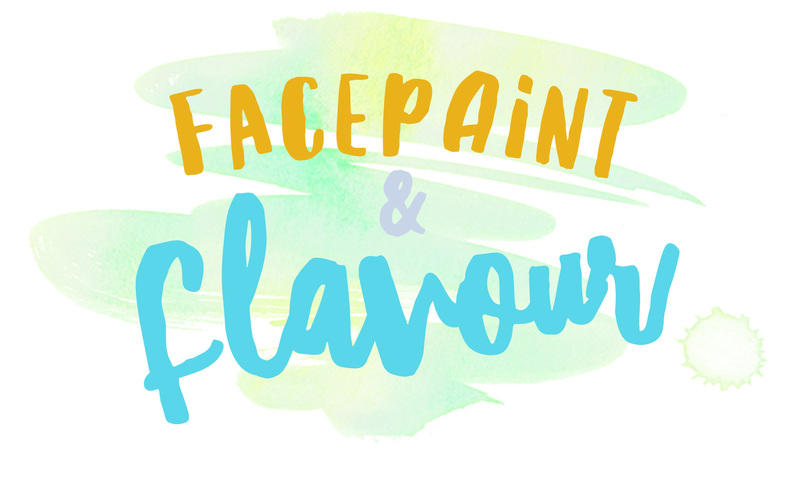 “Let’s call it a citrus coulis and see if we can get away with it!” Sorry, guys, you didn’t. Bleurgh! Kass, on the other hand, got a genuine coulis. In fact there’s a lot of work gone into this fruit. One wonders if some frustrated vegetable-carver didn’t make it after their big break on the Generation Game and is now in charge of the special diet puds. “At last, my chance to shine!”. Sorry, dude, no amount of melon artistry can stop us from wondering what happened to the other half of that grape. Ah, here are the other grapes! Mel’s entry bears closer resemblance to a snack I give my two year old than a festive dessert- because that’s the way I cut her grapes too. Did you get a bib and wet wipe with that? Well it has to be Ann, doesn’t it? 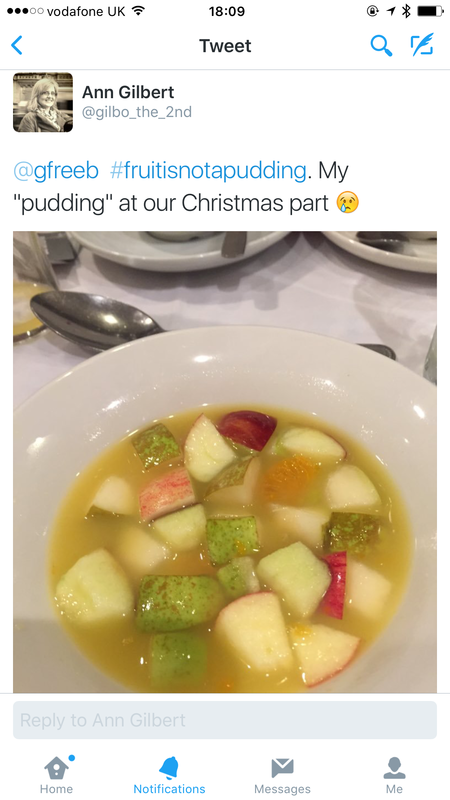 I want to give her a big hug after that grotty pud; but instead she’ll have to settle for some Cocoa Libre chocolate penguins and a #fruitisnotapudding wooden spoon, which will be in the post as soon as Royal Mail can haul themselves away from the Doctor Who Christmas special. Well-deserved win there, Ann! 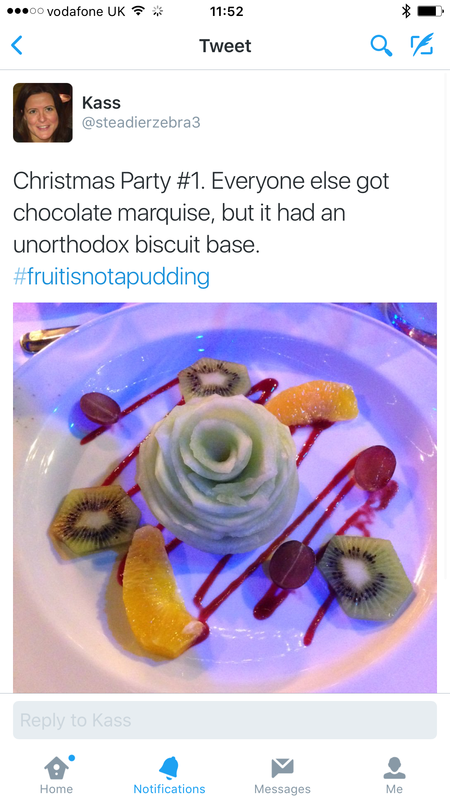 At least someone had put some thought into the aesthetics of my non-pudding. Although I should add that I don’t actually like either galia melon or kiwi fruit. Still, the trauma is now behind us; I’m off to stick my head into a giant chocolate mousse. Merry Christmas, everyone!